Cruise ship design is a very personal thing but we have a look at some of what’s out there these days, including some of their more desirable elements as well as some of the less desirable. We look at wrap-around teak promenade decks, real steamer chairs with blankets and forward-facing lounges, but also at gyms that rob those sameforward-facing views from other passengers. We look at two of the more elegant classes of cruise ship, the “R” ships from St Nazaire and the “Vista” class from Marghera, which include two of Cunard’s Queens as well as P&O’s Arcadia. Elsewhere, MSC announces that it will escape the Dubai crowd by sailing from Abu Dhabi next winter (although still allowing a Dubai embarkation option). Meanwhile, the number of cruise visitors to Antarctica is set to plummet as new fuel requirements come into play. And two weeks ago we erred on Havana – the Cuban port will actually have three cruise ships based there next winter and not just the two we mentioned. With all the new ships that have been delivered in the last decade and new orders that are starting to return to the shipyards, there is no question but that we are living in a time when we are lucky to have such a huge selection of ships to choose from when it comes to taking a cruise. 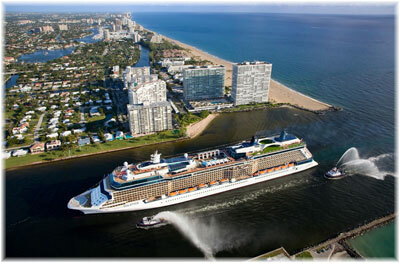 But there is also no question that there is a lot of controversy over some aspects of cruise ship design. Some lines insist on walk-around teak promenade decks, real steamer chairs and forward-facing lounges, whilst others completely ignore these traditional requirements, placing gyms and work-out rooms in the best space on the ship with a view forward, inaccessible promenade decks (those on the Carnival Destiny class have only one door on each side and have no chairs to sit on) and aluminium and plastic-framed deck chairs on the top decks. Just who thought up the idiotic idea of putting the gym at the forward end of the ship and robbing the best views from the rest of the passengers? Take a line like Holland America Line, for example, which prides itself on making sure that every one of its ships has a completely walk-around promenade deck and forward-facing lounge, the Crows’ Nest, in which to enjoy the sea’s horizon and vistas of the way ahead. All three of Cunard Line’s Queens have that forward-facing lounge (the Queen Mary 2 actually has a suite of them) and all three also have wrap-around promenade decks. Public rooms that recall earlier eras are also an attraction on these ships. All three ships are an improvement on Queen Elizabeth 2 in that the only public forward-facing lounge on that ship had been replaced early on in her career by a galley. Over at sister line P&O Cruises, meanwhile, the Oriana and Aurora are two of the better-looking cruise ships ever built, and also benefit from walk-around promenades and forward-facing Crow’s Nest lounges, as does the more recent Arcadia. When it comes to good-looking cruise ship classes, probably two of the most attractive classes of ship are the eight original almost identical “R” ships and the eleven “Vista” class ships, which differ in their details so that some are better looking than others. The “R” ships were built for the now-defunct Renaissance Cruises and are now operated variously by Oceania, Azamara, Princess, P&O and soon Hapag-Lloyd Cruises. 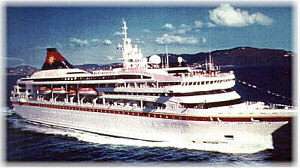 This class of eight “smaller” cruise ships, accommodating 684 guests each, was built by Chantiers de l’Atlantique, who later built the Queen Mary 2. While their original dark-blue hulls made them rather heavy looking, today they all carry white hulls and do have a look a elegance about them, especially at the forward end, where balconies and windows replace what is often a solid blank of white-painted steel at the forward end of a cruise ship superstructure. Their one short-coming is that they do not have wraparound promenade decks, just one to each side of the ship, although they do have forward-facing lounges. 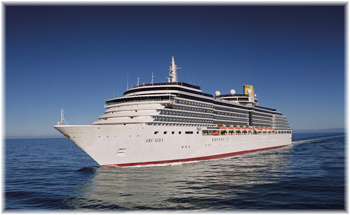 The “Vista” class cruise ships are all products of Fincantieri’s Marghera shipyard in Italy. They were built to a Panamax design that sees them reach the maximum dimensions allowable in the present Panama Canal (which is now being enlarged). These ships benefit from walk-around promenades and forward-facing lounges. The best looking of the “Vistas” must be the “three” Queens – Queen Victoria, Queen Elizabeth and Arcadia, the latter having actually been intended as the Queen Victoria for Cunard but then transferred to P&O when it was decided to build a slightly longer Queen Victoria instead. 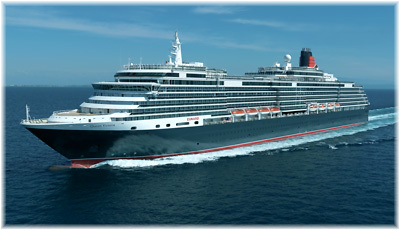 A “Vista” class cruise ship in Cunard colours is very striking from almost any angle. And the Arcadia in P&O colours is almost as attractive. Next would come the “Vistas” operated by Costa, two of whose ships, the Costa Atlantica and Costa Mediterranea, are actually “Spirit” class Panamax ships built by Aker Yards (now STX Europe) of Finland and have gyms up forward on top instead of lounges. The Marghera-built sisters Costa Luminosa and Costa Deliziosa have been delivered to a hybrid “Spirit/Vista” design and Costa Deliziosa will undertake Costa Cruises’ first world cruise since the days of the Danae and the Daphne. The 99-night cruise departs on December 28 and is being sold either as a full world cruise or in three sectors – 29 nights from Savona to Los Angeles, 38 nights from Los Angeles to Singapore or 31 nights from Singapore to Savona. The Costa Deliziosa will thus join three other “Vistas” class ships that offer world cruises, the two Cunard Queens and the Arcadia. What marks out the Costa ships of course is their yellow and blue “tin can” funnels. Least handsome of the “Vistas” must be those operated by Holland America, which carry two funnels in line aft, one of which appears to have been mounted backwards. These are the “directional sisters” Zuiderdam, Oosterdam, Westerdam and Noordam (for south, east, west and north), plus the more recent “Signature” class ships Eurodam and Nieuw Amsterdam, making up a class of half a dozen ships for Holland America Line. Like all Holland America ships, they all maintain the walk-around promenade decks and forward-facing Crow’s Nest lounges. The “Spirit” class ships that we mentioned earlier number half a dozen and in addition to the two Costa ships named above, include the Carnival Spirit, Pride and Legend, which for some reason took their names from the original trio of Seabourn ships and are probably the best-looking of the Carnival ships, with their whale-tail funnels. 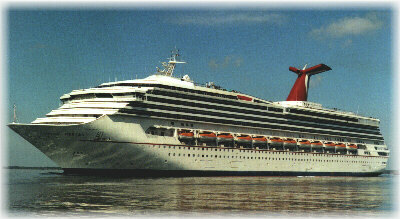 A fourth was the Carnival Miracle of 2004, which will go south to Australia next year to become Carnival’s first ship to be based year-round outside the United States. The only problem with these ships, however, is that every single Carnival ship has its gym mounted on top of the ship forward and this concept was also applied to the “Spirit” class ships. Not only that, but this forward positioning of the gym has also passed over to Costa Cruises, whose ships are now all built on Carnival platforms. Even on the world cruiser Costa Deliziosa a Samsara Spa has taken up this prime forward location. Elsewhere, many are the fans of the ships of Royal Caribbean, whose sterns have traditionally been round and whose bows are more graceful than the run-of-the-mill cruise ships operated by some other lines. 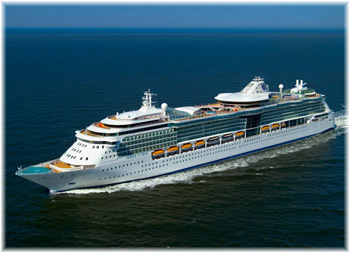 Probably the best-looking of the Royal Caribbean ships are the four “Radiance” class Panamax vessels, Radiance of the Seas, Brilliance of the Seas, Serenade of the seas and Jewel of the Seas, which have been completed to similar dimensions to the “Vistas.” But while some of these ships may have a walk-around promenade, many miss the forward-facing lounge, which seems to have been supplanted by the Viking Crown lounge with a view over the midship decks. Princess Cruises has been known for having unusual designs, dolphin’s heads, platypus bill bows, bird’s nest funnels and “shopping trolley handles,” as most people like to call the Skywalker bar in the aileron aft on the Grand Princess sisters. 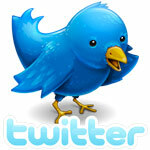 Two of their ships, the Coral Princess and Island Princess, even have hair curlers in their bird’s nest funnels. But things are starting to change, in some ways anyway. The Grand Princess was modified at Grand Bahama Shipyard this spring with the removal of her shopping trolley handle and the installation of some gracefully tiered decks aft, which had previously been in the shade of the Skywalker bar, which had to be removed because of problems of metal fatigue. And many are saying they like the appearance of the new Royal Princess and Regal Princess, which haven’t yet been built, but also that they like the appearance of the third of this class, the new ship intended for P&O, even more because she has two more traditional funnels. 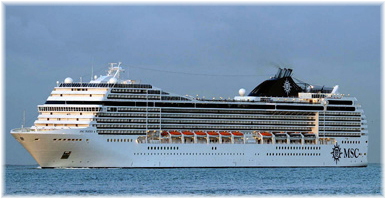 MSC Cruises, the best present client for STX France at St Nazaire, began with two quite handsome ships with the MSC Opera and MSC Lirica, but as their ships got larger they became less attractive. The MSC Poesia class, for example, has too much tophamper forward while the MSC Fantasia class somehow seem to have got around this problem and are slightly better looking ships. The only problem with the latter is that while her forward-facing lounge has not been supplanted by a gym, it is only available to passengers booked in MSC Yacht Club, which is just First Class by another name. When it comes to the ugly, you can say what you want about shopping trolley handles but there have to be two clear winners here, and unfortunately Norwegian Cruise Line owns them both. The Pride of America, started at Pascagoula, Mississippi, and completed in Bremerhaven in 2005, has such a long superstructure that she appears to have almost no bow at all. And last year’s Norwegian Epic, with her blue carbuncle of suites above the bridge, is positively ugly. This is a shame, as NCL had been known for better-looking ships with their first newbuildings. Designed originally for Star Cruises and built with extra length (and speed) for longer passages over the Pacific, the earlier ships’ length gave them a sleeker and more streamlined appearance. However, the application of so-called “hull art” to every ship in the fleet does somewhat detract from their appearance, at least to some. And more recently, in order to make more money, NCL has been installing balcony cabins in what used to be these ships’ forward-facing lounges. Will we see better-looking ships? 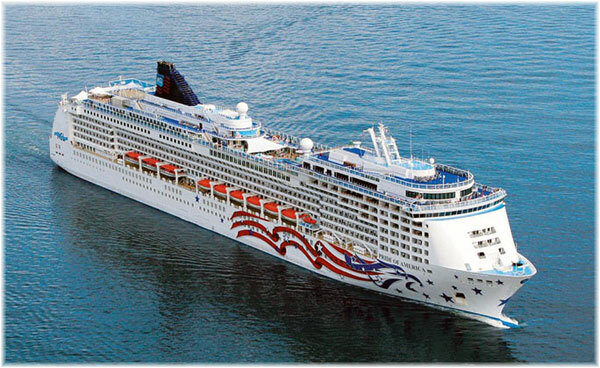 The two new NCL ships ordered from Meyer Werft will be vastly better looking than Norwegian Epic. The new Royal Caribbean ship (or ships) from the same yard, to be called Project Sunshine, will probably be graceful as well. But the larger these ships get the more tiered rows of balconies the ship designers and shipyards have to deal with, often as many as seven storeys at a time. Meyer Weft has never built an ugly ship, but nevertheless, overcoming the problems of size and multiples decks of balconies on the Celebrity Solstice class has been quite an achievement. Basically, the bigger the ships get the more difficult it seems to be to keep them pretty, case in point the great hulking giants called Oasis of the Seas and Allure of the Seas, looking like whales that have eaten too much. Set against these of course we also have some more handsome ships of a more modest scale, viz. Oceania’s new Marina and Seabourn’s latest trio. But even here mistakes can be made. The ten-year-old Silver Whisper, for example, is a much better looking ship than the Silver Spirit, which appears to be all heaped up forward with extra gills. What I have said here is completely subjective of course, and very general, but it makes for an interesting discussion, even if you disagree, and one that people should worry about. It all comes down to choosing your ship wisely so that you will not be disappointed. With all of Costa, Aida and Royal Caribbean all sailing from Dubai, MSC Cruises has elected to base its 1,560-berth MSC Lirica away from the crowds in Abu Dhabi next winter, when it adds the Emirates as a new destination for 2011-12. 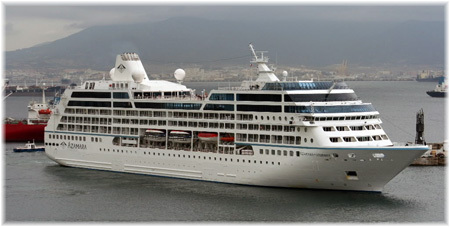 The MSC Lirica which until now has gone to South America each winter, will this year run a full schedule of nineteen 7 night cruises from Abu Dhabi, with a departure every Sunday from October 30 through March 4, 2012 or alternatively from Dubai every Friday from October 28 to March 9, 2012. Stopping at Kasha and Muscat in the Sultanate of Oman as well as Al Fujairah in the United Arab Emirates, and with two nights in Abu Dhabi and Dubai, guests on MSC Lirica can enjoy the region’s most impressive attractions through a comprehensive range of excursions. As the only cruise company to call regularly at Khasab, MSC Cruises offers privileged access to a little-known paradise. Dubbed the “Norway of Arabia,” its rugged coastline boasts spectacular fjord-like inlets dotted with fishing villages, which guests of MSC Cruises will be able to visit in traditional Arab dhows, stopping as well to swim in the waters around Telegraph Island. Alternatives will include a coach tour to Khasab’s dramatic 17th century fort and a jeep safari through breathtaking scenery to the mountain peak of Jebel Harim. Similarly eclectic outings are available from Muscat, from dolphin watching and “dune bashing” in the Wahiba Sands wilderness to private dhow cruises and visits to castles and mosques. From Al Fujairah, guests can choose between a desert discovery trip, a scenic and cultural tour of the coast or a half-day of relaxation on the beach between the beautiful Hajar Mountains and the warm waters of the Gulf. Meanwhile, Abu Dhabi makes for interesting city tours, as well as offering the opportunity for a behind-the-scenes look at the Yas Marina Formula 1 Circuit and a trip to Ferrari World theme park, where visitors can ride the world’s fastest roller coaster. For a change of pace, there is a visit to the oasis town of Al Ain, known as the “Garden City” for its lush greenery (the first in the Emirates to become a UNESCO World Heritage Site), a face-to-face encounter with majestic birds of prey at the Abu Dhabi Falcon Hospital or the chance to enjoy afternoon tea at the sumptuous Emirates Palace. From the world’s tallest building to man-made islands in the shape of a palm tree, or even the world, Dubai is not short of landmarks, and cruisers with MSC will be able to enjoy shopping in a traditional souk, swimming with dolphins or taking a romantic sunset cruise in a traditional dhow. The International Association of Antarctica Tour Operators (IAATO) has recently released its final passenger numbers for 2010-11, with the total number of visitors to the region travelling with IAATO members coming to 33,824. This includes those travelling on traditional expedition ships, yachts, larger cruise-only vessels and visitors participating in land programs. The overall seasonal results reflect a decrease of 8.3% from last year’s total of 36,875. Traditional small and medium-size expedition ships, which carry 500 or fewer passengers and conduct landings, accounted for 18,534 passengers, a decline of nearly 13% from 2009-10. There were a total of 14,373 passengers in the cruise-only category, vessels that carry more than 500 passengers and only travel through the area without disembarking their guests ashore in Antarctica. This represented a decline of just over 4%. Of these lines, only Holland America and Azamara will still visit Antarctica in the future, while Crystal, Oceania and Princess will remove the Antarctic from their itineraries. This is a result of new regulations that require ships to carry only light diesel oil when visiting the area, and not the heavier bunker oils that can cause the worst spills in case of an accident. A much smaller air-sea category that includes a combination of air transportation to Antarctica and small-ship cruising tallied at 531 visitors, while land tourism accounted for only 386. More than 100 different nationalities were represented last season. The United States (at 37%), Australia (10%), the UK (8%), Germany (7%) and Japan, the Netherlands and China (at 3% each) topped the list. With the ban on heavy fuel oil imposed by the International Maritime Organization (IMO) to take place this August, IAATO projects a significant decrease in the cruise-only category from 14,373 passengers to less than 5,000 for 2011-12. 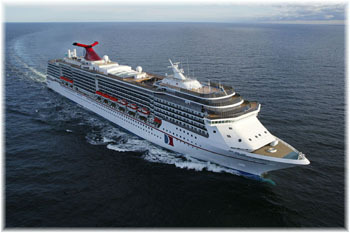 The number of voyages by 500-plus passenger vessels is expected to decrease from twelve last season to just five in 2011-12. Because of this, as well as the lingering effects of a slow economy, the overall number of visitors travelling with IAATO operators for 2011-12 is now projected at 25,319, fully a 25% drop from last season. On July 11, we stated that there would be two ships cruising from Havana with the 25,611-ton Louis Cristal and 4,490-ton Ariana (“Havana To Get Another Cruise Ship”). In fact, as a reader from Canada has pointed out, there will actually be three. In addition to the first two named, Spain’s Happy Cruises will be sailing the 19,093-ton Gemini from Havana on a second season of cruises to Cozumel, Grand Cayman and Isla Paraiso. Happy Cruises is of course the only Spanish cruise line that can do this, as Pullmantur and Iberocruceros are both now US-controlled, and indeed Pullmantur had to close its own Cuban operation when it was taken over by Royal Caribbean.